One of the joys of being on my ordination retreat was that we were a long way from the light pollution of 'civilisation'. So for the first time I got to see the northern stars! Each night as we emerged from our evening puja at about 10pm I would pause to look up and marvel at the stars - viewing was good about 95% of the time. When the retreat started in early April, Leo was almost directly overhead at that time of night. Orion was still above the western horizon, and many other constellations which I had never seen before were also visible - notably Ursa Minor and the Pole Star, a real novelty for this southern hemisphere dweller. As the weeks went by Orion strayed closer to the horizon each night until he was no longer visible at 10pm, and Leo was chasing after him, leaving Virgo and then Libra to the top spot. But what really captivated me was Venus, Lucifer, the Evening Star. The name Lucifer means simply "Light Bringer" and probably refers to his being the brightest star in the heavens. By lining up a couple of pointer stars I was able to observe Lucifer moving against the backdrop of the stars, and even, after a few weeks for him to go retrograde and retrace his steps. This is one of those things that I have seemingly always known about, taken for granted even, but can now confirm, having seen it with my own eyes. The linking of Lucifer, the Morning Star, with Satan or the Devil in the Christian tradition is usually put down to a misreading of Isaiah (14:12) "How art thou fallen from heaven, O Lucifer, son of the morning!". Isaiah it seems was referring symbollically to a king of Babylon, probably Nebuchadnezzar (though this is disputed). Origen (The 3rd Century Christian Father) seems to have been the first to make the misidentification, although it was Augustine who cemented it (in The City of God, XI,15), and Dante who popularised it. The whole story of the Christian Devil seems to be a comedy of errors - recounted in many places although my favourite is an art book by Luther Link - The Devil : the Archfiend in art from the 6th to the 16th century. However as my observations have made clear, and this is my point, far from having fallen, Lucifer is still the brightest star and still traverses the heavens! Although the misidentification is patent, and deflates the idea of the morning star being related to evil incarnate, this observation still seems significant to me. For one thing it shows how a simple misunderstanding can propagate through a civilisation and become significant - a meme with a life of it's own. For another it reminds me that the understanding of Heaven and Hell in the west owes more to Dante and Milton than to the Bible. I recently rewatched the film Dogma which despite it's ironically didactic, even evengelical, tone (seeking to convert us not to Christianity, but to a very liberal humanism), relies on Dante and Milton for it's imagery and story without seemingly being at all aware that it is doing so. Perhaps the unfallen Lucifer reminds us that unacknowledged aspects of our psyche - what Jung called the Shadow - can still be manifest, even if we ignore, or demonise them. He also reminds us that what is unacknowledged need not in fact be 'bad' or 'evil', but can be, like Lucifer, a bringer of light. Interestingly when reading Milton the modern reader generally seems to find Lucifer the more symapthetic character. Jehovah comes across as domineering and bombastic, whereas Lucifer clearly has good cause - it seems from the story - to be unhappy with the abitrary and summary way in which he is displaced in the eyes of the creator by the rather wet figure of Jesus. 'Self-awareness - an important aspect of Buddhist practice - means taking in every aspect of our psyche including the bits we would rather not. Indeed spiritual progress is hardly thinkable without acknowledging that currently we are sunk in a mire of greed and hatred and delusion. For Shinran this was so much the case that he could not conceive of us ever escaping without the grace of the Buddha to extract us. However Lucifer is also a bright star and this reminds us that there is hope, there is light in the world. Light is a frequent symbol in Buddhist texts - the Buddha is a lamp who lights the way in the darkness of our ignorance. We Western Buddhists have responded strongly to the image which is seen in our adoption of "Enlightenment" as a translation for Bodhi despite the two concepts being etymologically unrelated. Ignorance is darkness, and Awareness is light. In the Mahayana texts Buddhas are often seen illuminating the universe with rays of light, and Bodhisattvas themselves are said to be made of light. For Buddhists the Buddha is the light at the end of the tunnel, and the central image of the Bardo Thodol is of the light of the Dharmadhatu. The goal of Buddhists is not simply to bask in the light of a saviour, even in Pure Land Buddhism! It is to become Buddhas, to becomes a lamp ourselves. If we make the effort towards awareness then we become light bringers too! 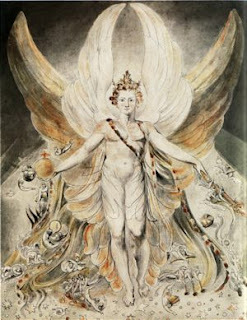 - Image: Lucifer (before the fall), William Blake.